The Journal of Feline Medicine and Surgery confirms that feline emotional wellbeing, behavior and physical health are a result of how comfortable they are in their environment. Understanding how our cats interact with their environment can help us create a space for owners and cats to mutually thrive together. Not only does your feline's wellness rely on her environmental conditions, but also on social interaction between humans. Often cat owners that allow their cats to roam outdoors are surprised to find that their cat is continually crossing major streets and roaming far beyond their immediate neighborhood. Lastly, allowing cats to roam outdoors affects the surrounding native wildlife populations. While owned cats do not hunt animals for survival, they will kill and maim animals based on instinct. This predation can have a significant impact on rodent and bird species. • Keep a litter tray in a private area. Be sure to clean regularly, removing eliminations daily, so cats will not be reluctant to use the box. Indoor cats will improperly eliminate or hold a bowel movement for days if they feel uncomfortable in their space. Avoid a potential health issue by keeping it clean. • While an indoor environment may be perceived as safer, be sure to carefully place potentially toxic house plants and lock cabinets with cleaning supplies. We know how curious cats can be- they'll try to get inside anything left slightly ajar. • Provide a scratching post or climbing wall, balls, feathers, or other play toys. Some cats like catnip, and this can be placed inside toys. Cats love to be up high, some people build walkways, close to the ceiling, around a room. 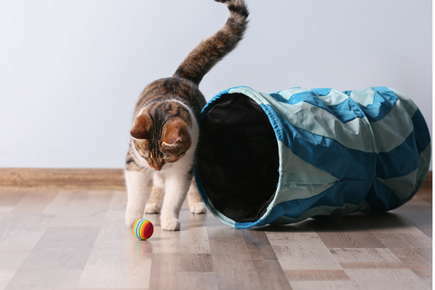 Keep your feline busy, and you'll be their main companion. • Be sure to check crawl spaces, attics, washer and dryers, dishwashers and refrigerators before and after use. • Consider getting them a companion. At first, felines may be reluctant to welcome another cat, but over time most thrive due to the interaction. For those cats who refuse to be a strictly indoor cat, there are things you can do to help protect them when outside. If you have a solid backyard fence, you can build an overhang at the top of the fence with piping and netting. The overhang should be about two feet long, and project inward at about a 45 degree angle, so the cat can not jump over the fence, and it also makes it harder for another cat to jump into your yard. If you do not have a solid back yard fence, you can build an enclosed patio space so the cats have access from the house. Ellis, SL; Rodan, I; Carney, HC; Rochiltz, I; Shearburn, LD; Sundahl, E; and Westropp, JL. “AAFP and ISFM Feline Environmental Needs Guidelines.” Journal of Feline Medical Surgery, March 2013. American Association of Feline Practitioners. “Confinement of Owned Indoor Cats Position Statement.” 2007.